In the previous post I gave a brief introduction to the third edition of my textbook, Stochastic modelling for systems biology. The algorithms described in the book are illustrated by implementations in R. These implementations are collected together in an R package on CRAN called smfsb. This post will provide a brief introduction to the package and its capabilities. if you have a reason for wanting it. The vignette gives a quick introduction the the library, which I don’t need to repeat verbatim here. If you are new to the package, I recommend working through that before continuing. Here I’ll concentrate on some of the new features associated with the third edition. Much of the book is concerned with the simulation of stochastic kinetic models using exact and approximate algorithms. Although the primary focus of the text is the application to modelling of intra-cellular processes, the methods are also appropriate for population modelling of ecological and epidemic processes. For example, we can start by simulating a simple susceptible-infectious-recovered (SIR) disease epidemic model. The focus of the text is stochastic simulation of discrete models, so that is the obvious place to start. But there is also support for continuous deterministic simulation. My favourite toy population dynamics model is the Lotka-Volterra (LV) model, so I tend to use this frequently as a running example throughout the book. We can simulate this (exactly) as follows. The first two editions of the book were almost exclusively concerned with well-mixed systems, where spatial effects are ignorable. One of the main new features of the third edition is the inclusion of a new chapter on spatially extended systems. The focus is on models related to the reaction diffusion master equation (RDME) formulation, rather than individual particle-based simulations. For these models, space is typically divided into a regular grid of voxels, with reactions taking place as normal within each voxel, and additional reaction events included, corresponding to the diffusion of particles to adjacent voxels. So to specify such models, we just need an initial condition, a reaction model, and diffusion coefficients (one for each reacting species). So, we can carry out exact simulation of an RDME model for a 1D spatial domain as follows. Exact simulation of discrete stochastic reaction diffusion systems is very expensive (and the reference implementation provided in the package is very inefficient), so we will often use diffusion approximations based on the CLE. We can think of this algorithm as an explicit numerical integration of the obvious SPDE approximation to the exact model. The package also includes support for simulation of 2D systems. Again, we can use the Spatial CLE to speed things up. Although much of the book is concerned with the problem of forward simulation, the final chapters are concerned with the inverse problem of estimating model parameters, such as reaction rate constants, from data. A computational Bayesian approach is adopted, with the main emphasis being placed on “likelihood free” methods, which rely on forward simulation to avoid explicit computation of sample path likelihoods. The second edition included some rudimentary code for a likelihood free particle marginal Metropolis-Hastings (PMMH) particle Markov chain Monte Carlo (pMCMC) algorithm. The third edition includes a more complete and improved implementation, in addition to approximate inference algorithms based on approximate Bayesian computation (ABC). Simple rejection-based ABC methods are facilitated by the (very simple) function abcRun, which just samples from a prior and then carries out independent simulations in parallel before computing summary statistics. A simple illustration of the use of the function is given below. Naive rejection-based ABC algorithms are notoriously inefficient, so the library also includes an implementation of a more efficient, sequential version of ABC, often known as ABC-SMC, in the function abcSmc. This function requires specification of a perturbation kernel to “noise up” the particles at each algorithm sweep. Again, the implementation is parallel, using the parallel package to run the required simulations in parallel on multiple cores. A simple illustration of use is given below. Although the inference methods are illustrated in the book in the context of parameter inference for stochastic kinetic models, their implementation is generic, and can be used with any appropriate parameter inference problem. The resulting value, model is an SPN object which can be passed in to simulation functions such as StepGillespie for constructing stochastic simulation algorithms. In addition to the above R packages, I also have some Python scripts for converting between SBML and the SBML-shorthand notation I use in the book. See the SBML-shorthand page for further details. Although R is a convenient language for teaching and learning about stochastic simulation, it isn’t ideal for serious research-level scientific computing or computational statistics. So for the third edition of the book I have also developed scala-smfsb, a library written in the Scala programming language, which re-implements all of the models and algorithms from the third edition of the book in Scala, a fast, efficient, strongly-typed, compiled, functional programming language. I’ll give an introduction to this library in a subsequent post, but in the meantime, it is already well documented, so see the scala-smfsb repo for further details, including information on installation, getting started, a tutorial, examples, API docs, etc. This blog post started out as an RMarkdown document, the source of which can be found here. 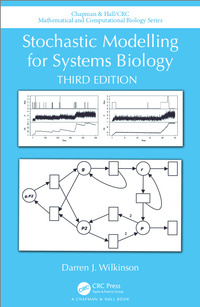 The third edition of my textbook, Stochastic Modelling for Systems Biology has recently been published by Chapman & Hall/CRC Press. The book has ISBN-10 113854928-2 and ISBN-13 978-113854928-9. It can be ordered from CRC Press, Amazon.com, Amazon.co.uk and similar book sellers. New chapter on spatially extended systems, covering the spatial Gillespie algorithm for reaction diffusion master equation (RDME) models in 1- and 2-d, the next subvolume method, spatial CLE, scaling issues, etc. Significantly expanded chapter on inference for stochastic kinetic models from data, covering approximate methods of inference (ABC), including ABC-SMC. The material relating to particle MCMC has also been improved and extended. Although some minor edits and improvements have been made throughout the text, there are two substantial new additions to the text in this new edition. The first is an entirely new chapter on spatially extended systems. The first two editions of the text focused on the implications of discreteness and stochasticity in chemical reaction systems, but maintained the well-mixed assumption throughout. This is a reasonable first approach, since discreteness and stochasticity are most pronounced in very small volumes where diffusion should be rapid. In any case, even these non-spatial models have very interesting behaviour, and become computationally challenging very quickly for non-trivial reaction networks. However, we know that, in fact, the cell is a very crowded environment, and so even at small spatial scales, many interesting processes are diffusion limited. It therefore seems appropriate to dedicate one chapter (the new Chapter 9) to studying some of the implications of relaxing the well-mixed assumption. Entire books can be written on stochastic reaction-diffusion systems, so here only a brief introduction is provided, based mainly around models in the reaction-diffusion master equation (RDME) style. Exact stochastic simulation algorithms are discussed, and implementations provided in the 1- and 2-d cases, and an appropriate Langevin approximation is examined, the spatial CLE. The second major addition is to the chapter on inference for stochastic kinetic models from data (now Chapter 11). The second edition of the book included a discussion of “likelihood free” Bayesian MCMC methods for inference, and provided a working implementation of likelihood free particle marginal Metropolis-Hastings (PMMH) for stochastic kinetic models. The third edition improves on that implementation, and discusses approximate Bayesian computation (ABC) as an alternative to MCMC for likelihood free inference. Implementation issues are discussed, and sequential ABC approaches are examined, concentrating in particular on the method known as ABC-SMC. Accompanying the text are new and improved on-line resources, all well-documented, free, and open source. Information and materials relating to the previous editions were kept on my University website. All materials relating to this new edition are kept in a public GitHub repo: darrenjw/smfsb. This will be simpler to maintain, and will make it much easier for people to make copies of the material for use and studying off-line. In addition to the main R package, there is an additional R package for parsing SBML models into models that can be simulated within R. This package is not on CRAN, due to its dependency on a non-CRAN package. See the repo for further details. There are also Python scripts available for converting SBML models to and from the shorthand SBML notation used in the text. Another major new resource associated with the third edition of the text is a software library written in the Scala programming language. This library provides Scala implementations of all of the algorithms discussed in the book and implemented in the associated R packages. This then provides example implementations in a fast, efficient, compiled language, and is likely to be most useful for people wanting to use the methods in the book for research. Again, I’ll provide a tutorial introduction to this library in a subsequent post, but it is well-documented, with all necessary information needed to get started available at the scala-smfsb repo/website, including a step-by-step tutorial and some additional examples. To statisticians and data scientists used to working in R, the concept of a data frame is one of the most natural and basic starting points for statistical computing and data analysis. It always surprises me that data frames aren’t a core concept in most programming languages’ standard libraries, since they are essentially a representation of a relational database table, and relational databases are pretty ubiquitous in data processing and related computing. For statistical modelling and data science, having functions designed for data frames is much more elegant than using functions designed to work directly on vectors and matrices, for example. Trivial things like being able to refer to columns by a readable name rather than a numeric index makes a huge difference, before we even get into issues like columns of heterogeneous types, coherent handling of missing data, etc. This is why modelling in R is typically nicer than in certain other languages I could mention, where libraries for scientific and numerical computing existed for a long time before libraries for data frames were added to the language ecosystem. To build good libraries for statistical computing in Scala, it will be helpful to build those libraries using a good data frame implementation. With that in mind I’ve started to look for existing Scala data frame libraries and to compare them. If MASS isn’t installed, it can be installed with a simple install.packages("MASS"). The above code snippet generates a CSV file to be used for the example. Typing ?Cars93 will give some information about the dataset, including the original source. Now let’s see how a similar task could be accomplished using Scala data frames. Although this looks OK, it’s not completely satisfactory, as the data frame is actually representing a matrix of Strings. Although you can have a data frame containing columns of any type, since Saddle data frames are backed by a matrix object (with type corresponding to the common super-type), the handling of columns of heterogeneous types always seems rather cumbersome. I suspect that it is this clumsy handling of heterogeneously typed columns that has motivated the development of alternative data frame libraries for Scala. Apart from the declaration of column types, the code is actually a little bit cleaner than the corresponding Saddle code, and the column types are all properly preserved and appropriately handled. However, a significant limitation of this data frame is that it doesn’t seem to have special handling of missing values, requiring some kind of manually coded “special value” approach from users of this data frame. This is likely to limit the appeal of this library for general statistical and data science applications. This is arguably the cleanest solution so far. Unfortunately the output isn’t quite right(! ), as there currently seems to be a bug in Csv.fromFrame which causes the ordering of columns to get out of sync with the ordering of the column headers. Presumably this bug will soon be fixed, and if not it is easy to write a CSV writer for these frames, as I did above for scala-datatable. If you really need a distributed data frame library, then you will probably want to use Spark. However, for the vast majority of statistical modelling and data science tasks, Spark is likely to be unnecessarily complex and heavyweight. The other three libraries considered all have pros and cons. They are all largely one-person hobby projects, quite immature, and not currently under very active development. Saddle is fine for when you just want to add column headings to a matrix. Scala-datatable is lightweight and immutable, if you don’t care about missing values. On balance, I think Framian is probably the most full-featured “batteries included” R-like data frame, and so is likely to be most attractive to statisticians and data scientists. However, it’s pretty immature, and the dependence on shapeless may be of concern to those who prefer libraries to be lean and devoid of sorcery! I’d be really interested to know of other people’s experiences of these libraries, so please do comment if you have any views, and especially if you have opinions on the relative merits of the different libraries. The full source code for all of these examples, including sbt build files, can be found in a new github repo I’ve created for the code examples associated with this blog. In the previous post I showed how the rscala package (which has replaced the jvmr package) can be used to call Scala code from within R. In this post I will show how to call R from Scala code. I have previously described how to do this using jvmr. This post is really just an update to show how things work with rscala. Once this is done, calling out to R from your Scala sbt project can be carried out as described in the rscala documentation. For completeness, a working example is given below. In this example I will use Scala to simulate some data consistent with a Poisson regression model, and then push the data to R to fit it using the R function glm(), and then pull back the fitted regression coefficients into Scala. This is obviously a very artificial example, but the point is to show how it is possible to call back to R for some statistical procedure that may be “missing” from Scala. If these two files are put in an empty directory, the code can be compiled and run by typing sbt run from the command prompt in the relevant directory. The commented code should be self-explanatory, but see the rscala documentation for further details. In particular, the rscala scaladoc is useful. In a previous post I looked at how to call Scala code from R using a CRAN package called jvmr. This package now seems to have been replaced by a new package called rscala. Like the old package, it requires a pre-existing Java installation. Unlike the old package, however, it no longer depends on rJava, which may simplify some installations. The rscala package is well documented, with a reference manual and a draft paper. In this post I will concentrate on the issue of calling sbt-based projects with dependencies on external libraries (such as breeze). This option is likely to be attractive to sbt (or IDE) users who don’t like to rely on a system-wide scala installation. sbt magically manages all of the dependencies for us so that we don’t have to worry about them. However, for calling from R, it may be desirable to run the code without running sbt. There are several ways to achieve this, but the simplest is to build an “assembly jar” or “fat jar”, which is a Java byte-code file containing all code and libraries required in order to run the code on any system with a Java installation. Assuming that it does, you are now ready to try running the code from within R.
This works fine, but is a bit clunky. Tighter integration between R and Scala would be useful, which is where rscala comes in. rscala provides a very simple way to embed a Scala interpreter within an R session, to be able to execute Scala expressions from R and to have the results returned back to the R session for further processing. The main issue with using this in practice is managing dependencies on external libraries and setting the Scala classpath correctly. By using an assembly jar we can bypass most of these issues, and it becomes trivial to call our Scala code direct from the R interpreter, as the following code illustrates. The CRAN package rscala makes it very easy to embed a Scala interpreter within an R session. However, for most non-trivial statistical computing problems, the Scala code will have dependence on external scientific libraries such as Breeze. The standard way to easily manage external dependencies in the Scala ecosystem is sbt. Given an sbt-based Scala project, it is easy to generate an assembly jar in order to initialise the rscala Scala interpreter with the classpath needed to call arbitrary Scala functions. This provides very convenient inter-operability between R and Scala for many statistical computing applications. In previous posts I’ve shown how the jvmr CRAN R package can be used to call Scala sbt projects from R and inline Scala Breeze code in R. In this post I will show how to call to R from a Scala sbt project. This requires that R and the jvmr CRAN R package are installed on your system, as described in the previous posts. Since I’m focusing here on Scala sbt projects, I’m also assuming that sbt is installed. Once this is done, calling out to R from your Scala sbt project can be carried out as described in the jvmr documentation. For completeness, a working example is given below. If these two files are put in an empty directory, the code can be compiled and run by typing sbt run from the command prompt in the relevant directory. The commented code should be self-explanatory, but see the jvmr documentation for further details. In the previous post I showed how to call Scala code from R using sbt and jvmr. The approach described in that post is the one I would recommend for any non-trivial piece of Scala code – mixing up code from different languages in the same source code file is not a good strategy in general. That said, for very small snippets of code, it can sometimes be convenient to inline Scala code directly into an R source code file. The canonical example of this is a computationally intensive algorithm being prototyped in R which has a slow inner loop. If the inner loop can be recoded in a few lines of Scala, it would be nice to just inline this directly into the R code without having to create a separate Scala project. The CRAN package jvmr provides a very simple and straightforward way to do this. However, as discussed in the last post, most Scala code for statistical computing (even short and simple code) is likely to rely on Breeze for special functions, probability distributions, non-uniform random number generation, numerical linear algebra, etc. In this post we will see how to use sbt in order to make sure that the Breeze library and all of its dependencies are downloaded and cached, and to provide a correct classpath with which to initialise a jvmr scalaInterpreter session. So we see that Scala Breeze code can be inlined directly into an R session, and if we are careful about return types, have the results of Scala expressions automatically unpack back into convenient R data structures. The actual breezeInit() function is given below. It is a little ugly, but very simple. It is obviously easy to customise for different libraries and library versions as required. All of the hard work is done by sbt which must be installed and on the default system path in order for this function to work. \"org.scalanlp\" %% \"breeze-natives\" % \"0.10\"